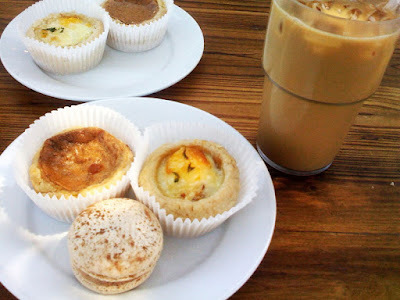 What better way to start a sunny carefree Sunday than with strong coffee, good company and a sweet/savory treat? 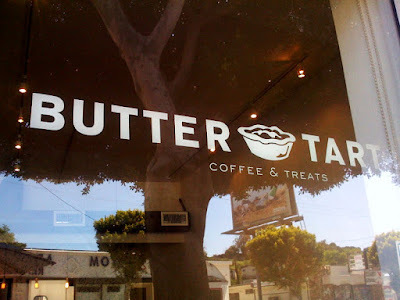 My friend was dogsitting this past weekend in Eagle Rock and called me about a new opening down the street at Verdugo and York called Butter Tart (4126 Verdugo Road; 323.258.TART). 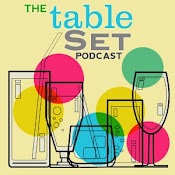 I hadn't heard about this sumptuous-sounding café, and since I love being early on the scene (and any kind of "tart") was quick to accept the date! Butter Tart is an unassuming storefront on Verdugo just up the block from Polka, and almost missable save for the white umbrellas and two tables out on the sidewalk. Inside is equally spare; clean wood veneer and earthy tones, brushed aluminum chairs and cardboard moose heads. 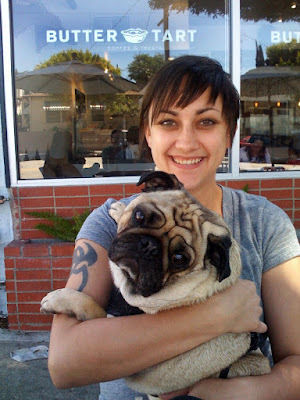 We opted to sit outside (not that we had a choice, pug in tow). 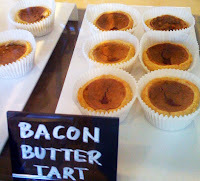 After some conversation and digestion, I did leave Butter Tart pleasantly full on life, but lightly reminded of my bittersweet experience at another pastry fad pop-up Xooro in Santa Monica. And the question on my mind - Beyond making a splash, can the operation pull its weight? Also that would have totally irked me too if they had made a comment on how much I was ordering. All you have to do is "think" about exercising, and the calories don't count.